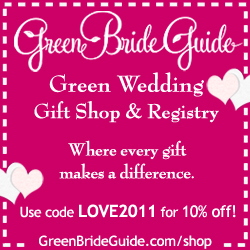 I posted an article previously about a book called Green Bride Guide and in the early Beagle Days I posted about an online/physical store 3R’s green registry. Since then I have seen many green stores pop up and much more green commerce (maybe because I have been looking more for them) but either way I have found Green Bride Guide website. I loved this book so it makes sense I would love the site! Green Bride Guide has compiled a ton of green items and for you to have for your home. The registry is broken down into categories, color, certification & eco-strategy. The pricing isn’t cheap but by no means is it expensive for eco-products. Not to mention it’s your wedding so you aren’t paying for it so go crazy! I have yet to meet a bride & groom who have asked for eco-friendly products for their wedding. If green items happen to be at Bed Bath & Beyond or Macy’s they would consider it but to go directly to a green business with a green registry seems out of many couples comfort zones. I, personally, would definitely register green. I honestly couldn’t afford it buy everything I would want for a green home all at once. I purchase piece by piece. A wedding registrty is a perfect way to start your new green lives together. You can build from there. You will also be forcing people who might not have otherwise been interested in green items to learn about something new. You could be creating a new greenie with your green registry. Keep that in mind.